Roots is celebrating their 44th birthday this month! 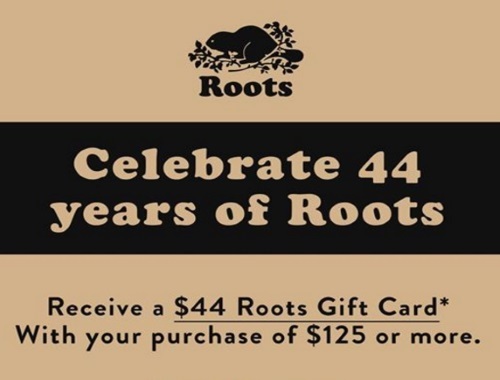 Today only receive a $44 Roots gift card with your purchase of $125 or more! Offer is valid in-store and online on Tuesday August 15, 2017 only. One gift card per purchase, three gift cards per household. Your gift card will be mailed to your billing address within 4-6 weeks. Gift card purchases excluded. Stay tuned for more birthday celebrations this month. I am hoping for a sweats sale, maybe 44% off? Here's hoping!